We are pleased to announce the appointment of Ian VanderBurgh as accompanist for the Grand Philharmonic Choir. Ian has been accompanying choirs in Waterloo Region for more than 15 years. From 2003 to 2018, he was the accompanist of the University of Waterloo Choir. He has also played with the University of Waterloo Chamber Choir, currently plays for the Wilfrid Laurier University Concert Choir, and enjoys the opportunity to rehearse and perform with other groups. Ian is a Lecturer in the Faculty of Mathematics at the University of Waterloo and has been Director of the Centre for Education in Mathematics and Computing since 2005. 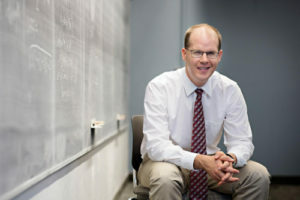 In 2008, Ian received a Distinguished Teaching Award from the University, and in 2016, Ian won the Canadian Mathematical Society’s Excellence in Teaching Award.